All eyes in the fast doorslammer world will focus on the Texas Motorplex Nov. 1-3, when the trendsetting all-concrete drag strip hosts not one, but two epic events with more than $125,000 in total prize money on the line. Headlining the all-eighth-mile weekend will be the inaugural Elite 16 $50,000-to-win event presented by Elite Motorsports and the Mid-West Pro Mod Series (MWPMS). 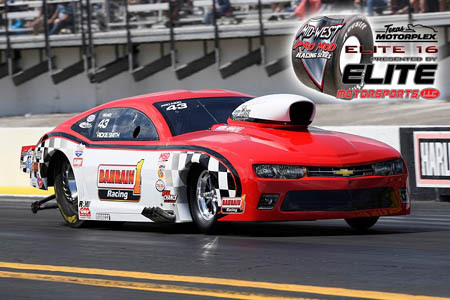 Featuring teams and drivers from the NHRA, PDRA, NMCA, TOPMA and MWPMS going head to head for the first time on the same track, the Elite 16 promises to be a spectacle in itself. But additionally, after heavy rain threatened the season-ending Frankenstein Engine Dynamics Mid-West Pro Mod Series World Finals earlier this month at Tulsa, Ok., the decision was quickly reached to move that race also to the same weekend at the Motorplex, just south of Dallas. "After hosting the season opener for the Mid-West Pro Mod Series, then having the Texas Outlaw Pro Mods visit us all summer long and the NHRA Pro Mods return to our national event for the first time in 10 years, everyone here just can't get enough of these wild cars and drivers," Texas Motorplex General Manager Andy Carter said. "So when the opportunity came to have the Mid-West Series again, in addition to the Elite 16 event, we jumped at the chance. We really couldn't be any happier about capping the year off with our biggest Pro Mod weekend ever." Live attendance to the three-day spectacle will be exclusively limited, however, to just 1,000 paying spectators, although a free, live online feed of all the action will be available through www.Bangshift.com, hosted by veteran drag racing journalist Chad Reynolds. Additionally, official MWPMS videographer Jimmy Biggs will contribute trackside and pitside footage and legendary announcer Al Tucci will make the live call from the Motorplex tower. Meanwhile, highly respected track prep specialist Tyler Crossnoe will make sure the racing surface is ready to handle repeated 3.7-second runs at more than 210 miles per hour. "We're pulling out all the stops to make this a truly remarkable and memorable weekend," MWPMS founder, owner and promoter Keith Haney said. "This is all about the racers, about the teams and about appreciation for what they do and what they spend to be out here every weekend. We want them all to know just how much they mean to us, how much they mean to the sport we all love so much, which is drag racing. "Every Pro Mod team on the grounds that weekend can expect a visit from Chad or Jimmy or even Al. Every driver will be interviewed at some point, but we also want to talk to the team owners and crew guys, the guys who make this all happen at tracks all across the country every weekend. It's going to be a great show on so many different levels." Haney explained that $50,000 is guaranteed to the Elite 16 winner, another $24,000 is slated for other Elite 16 qualifiers, and a $22,000 purse is up for grabs within the Mid-West Series, "making this the biggest, richest weekend ever in eighth-mile Pro Mod racing." The purse for the rest of the weekend, including a $15,000 Second-Chance Pro Mod race presented by Jerry Bickel Race Cars and the Summit Racing Equipment Top Sportsman class-which may become an official MWPMS class along with Top Dragster next year-will push the total to more than $125,000, he added. The $50K-to-win Elite 16 race will feature a whopping eight rounds of qualifying beginning Thursday (Nov. 1) for Elite Motorsports Pro Mod and Summit Top Sportsman before eliminations are run on Saturday. Another full slate of qualifying and racing will settle 2018 Mid-West Pro Mod Series championships on Friday in Pro Mod. Presently, Ron Muenks holds a slim lead in MWPMS Pro Mod points over Jim Sackuvich and Jonas Aleshire, while the Radial vs. the World list is headed by Daniel Pharris with Mark Micke, Houston racer Jeff Naiser and DeWayne Mills all well within striking distance. Among those expected to participate in the Elite 16 Pro Mod race are multi-time NHRA Pro Mod champ "Tricky Rickie" Smith, Elite Motorsports Pro Mod driver and two-time NHRA Pro Stock champion Erica Enders, 2018 U.S. Nationals winner "Stevie Fast" Jackson, legendary Texas racer and past PDRA Pro Extreme champion Frankie "Madman" Taylor, 2018 NMCA Pro Mod champion Jason Hamstra, and a slew of MWPMS stars. "These are the absolute best of the best in Pro Mod racing and like I said, it's an honor to have them come race at the Texas Motorplex," Carter said. "I'm excited for this combined Elite 16 and Mid-West Pro Mod Series weekend to show the entire world that this is the place to see the quickest and fastest doorslammers going after their biggest payday ever."